Kazami Shiro is KAMEN RIDER V3 who is a transformable man. He received a serious injury from members of the secret society: the mysterious Destron. But he had reconstructive surgery by KAMEN RIDER number 1 and number 2. 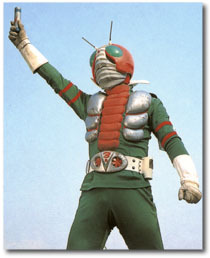 And he rose from the dead as KAMEN RIDER V3. 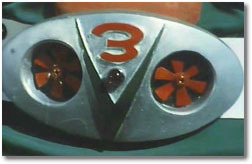 V3 is powered by wind energy which he gathers with the twin "Typhoon" fans in his belt. Whereas No.1 & No.2 were powered by single windmills, V3 is powered by both the right "Kamen Rider No.1 Typhoon" of Skill, and the left "Kamen Rider No.2 Typhoon" of Strength. 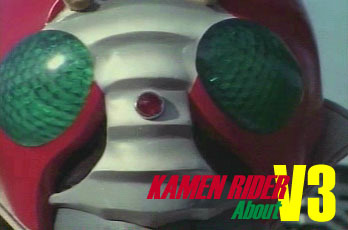 The Kamen Riders communicate "telepathically" via the antennae on top of their heads. This technological advancement allows perfect coordination between each Rider as they enter the battlefield. This little gadget resides in a special holster on the left side of V3's belt. By propelling this miniature satellite vertically into the air (max. height up to 500 m), V3 can monitor the surrounding terrain via the interface embedded in his visor. This is particularly useful for tracking fleeing enemies. 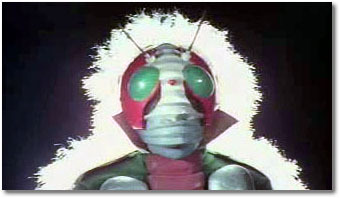 Kamen Rider V3's arsenal of deadly techniques are the most effective methods to expel the hideous minions of Destron! Favouring kicks over punches, V3's variety of moves deliver decisive conclusions to each battle, leaving his foes to literally exploding in his wake. 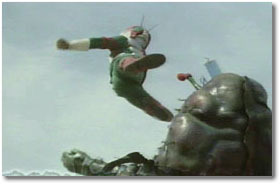 His signature move is the "V3 Return Kick" (Buisuri Hanten Kikku). All of the above abilities are part of Kamen Rider V3's "26 Secrets." However, Kazami Shiro has little knowledge of each of these hidden techniques and powers. Each new secret automatically reveals itself to protect Kamen Rider V3, should the need arise. Unfortunately, V3 also has an Achillies' Heel - several of them - know as the "Four Weaknesses." In a secret recording (hidden in their "memento" to Shiro), Kamen Rider No.1 & No.2 informed Kazami of these weaknesses - which almost was intercepted by Destron! We (the audience) were never informed of the first three of these weaknesses in detail.